The year has come to an end. This is the time a lot of us start thinking about resolutions. Personally I am not a fan of them. I find them to be weak and most of them don’t last. That is why the parking lot at the gym is always less crowded in March than at the beginning of the year. So why do resolutions not last? I mentioned them being weak, that is because they seldom have purpose and a reason, or strong ‘why’ behind them. If you are ready, this year let us try something different. Here is the idea, instead of writing things you want to do in the new year, sit down and write who you would like to become in the new year and why. Would you like to be healthier? Why is that important? Would you like to be less stressed? What benefits will that bring you? Sit down and write this out. A complete description of who you are committed to becoming and the reasons or why for that. Now look at the picture above this blog. 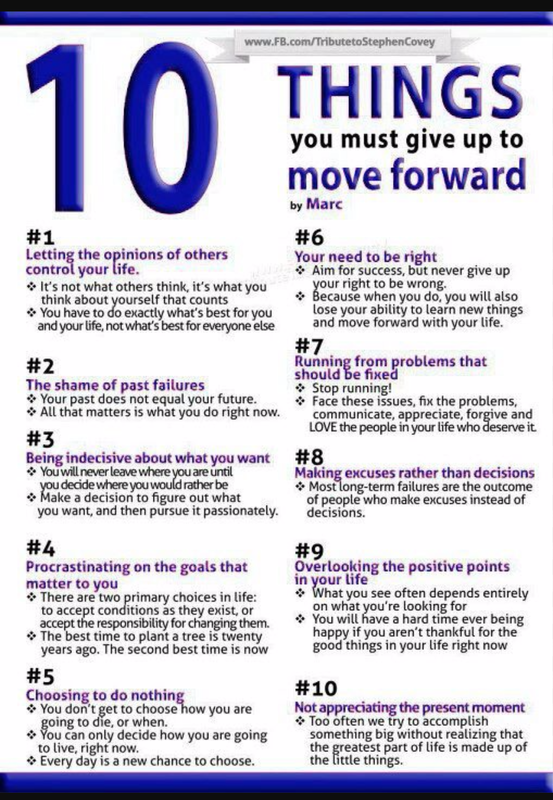 It is a list of things to give up to improve your life. It is a good list, offers reasons why, but I want you to create your own. Look at the person you are committed to becoming in 2016. Now think about what things in your life currently do not belong in a person like that. Write them down. This is your list of things to limit or remove from your life. Much like the list above you might want to include a why as well. Now understand as you go through the year, especially at first, you may slip up and do, say or be some of those things. That’s ok. The goal is to do them less until you can finally cleanse your life of any behavior that does not work in your new self. If you can quit them right away, congratulations. If not, do not worry. Old habits die hard and as long as you keep at it you will triumph. Do not get down on yourself, become your own cheerleader. If you notice yourself faltering, instead of judging yourself, just notice how less you are doing it and be determined to go even longer the next time. On a personal level, however you celebrate the new year, do so safely. I value all of you and look forward to teaching and learning from each other in 2016.